Tick is an easy to use and low cost Harvest alternative. If you're looking for time tracking software for your company, Tick and Harvest are two great options to consider. Both products launched in 2006 to help teams track their time, but they have different views on how and why your team needs to track their time. Harvest's focus is on helping teams capture their time so they can invoice clients or run payroll. So they have built features like weekly time sheets, expense tracking, and client invoicing. For Harvest, time tracking is what you do to get paid. 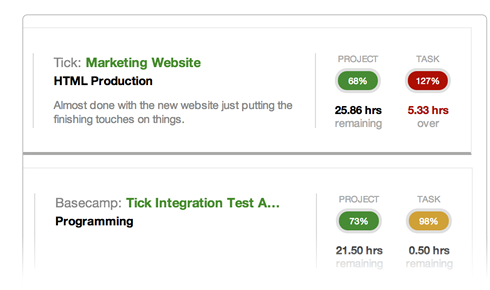 With Tick, everything is focused on helping your team hit your budgets. Tick's has always focused on helping teams identify where they are spending their time, so they can run more profitable projects. You get budget updates whenever you log a time entry and reports that tell you which projects are the most profitable. For Tick, time tracking is the key to a more profitable business. All Tick plans come with Unlimited Users. No difference between a company with 5 people or 5,000 people. "Before Tick, we had to guess whether or not we were being profitable or not. Now we know and can make adjustments during the month and prioritize certain clients and tasks. Tick ensures time-tracking is one less thing my tired mind has to remember." "Tick is an elegant stand-alone solution that does one thing really well—track time allotted, time billed, and time remaining. Time entry is really easy with the intuitive and responsive UI." "A useful time tracking tool starts with something you'll actually use. Tick's timecard is both straightforward and efficient in assigning time to a task and provides key project details like instant budget feedback as soon as your time is entered." "I am a contractor for an online company and we use Tick to keep track of all of the different tasks. I use it every day and I love it. It is easy to use and easy to make sure the exact time worked on a specific task."